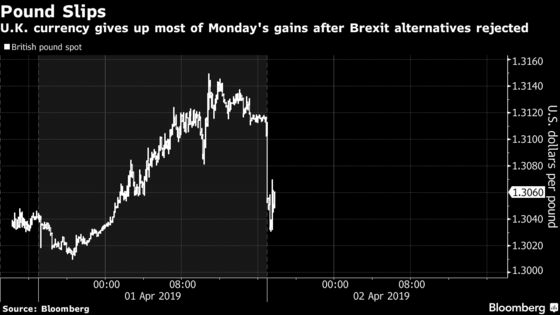 (Bloomberg) -- Today in Brexit: Parliament failed, and May’s deal looks set to come back for one more vote. The U.K.’s divided, entrenched Parliament voted no to every Brexit option again last night, and the ball is back in Theresa May’s court. On Tuesday she will force her Cabinet — in a marathon five-hour session — to confront the prospect of a long delay to delivering Brexit, Tim Ross reports. It’s politically toxic, but barring a miraculous recovery of her nearly-dead deal or a perilous U-turn to lead the country off a no-deal precipice, it’s almost certainly where we’re headed. Responding to Parliament’s failure, Brexit Secretary Steve Barclay hinted that the government’s immediate plan is to bring May’s unloved divorce deal back for one last vote. In good news for businesses and anxious stockpilers, he seemed to rule out a no-deal exit. But without the threat of Parliament clamoring for a soft Brexit, it’s going to be much harder for May to bring the Brexiteers in line. They still seem to think no-deal is an option worth fighting for. And, as my colleague Rob Hutton has argued for many months, some of them are much more interested in being right than winning. Last night made it clear that even if there’s almost a majority for some kind of soft Brexit, there’s massive opposition to it within the Tory party. (Just 37 Tories voted for the customs union plan, compared with 236 against, and 33 Tories backed staying in the single market, with 228 against. Support for a second referendum also came close in Parliament overall, but just 15 Tories voted for it.) That’s got to be comforting if you’re a Brexiteer. Even if Parliament comes back on Wednesday and somehow organizes its way to a soft-Brexit consensus, it would be almost impossible for a Tory leader to deliver it. So what’s May left with? The EU won’t accept a delay without a good reason (and there’s increasing reluctance to grant a long extension in any case, Ian Wishart reports from Brussels). One good reason was always a change of direction, but it now looks unlikely since the latest round of votes. That leaves a general election or a referendum as the options the bloc might deem valid. Is this May’s last roll of the dice? Back my deal or be stuck in Brexit limbo, risk losing your seat and maybe Brexit too? Put away the countdown calendars, we’re in for a long wait. Back in the real world: EasyJet said the lack of clarity over Brexit has hurt demand, just as the summer season gets under way. Its shares fell the most in more than two years. Irish Prime Minister Leo Varadkar, used to expressions of solidarity from EU leaders, will get a sterner message this week. German Chancellor Angela Merkel and French President Emmanuel Macron are expected to press Varadkar on his plans for protecting the EU’s border in the event of no-deal. UKIP infiltrators will tear the Tory party apart, writes Rachel Sylvester in the Times. Hammond’s Plan | Chancellor of the Exchequer Philip Hammond will tell the Cabinet on Tuesday that it needs to come up with its own compromise proposal—probably including a customs union—or put Brexit to a second referendum, the Times reports. He will tell colleagues a referendum is preferable to an election, because neither the party nor the country can afford the latter, the paper says. Boles Quits | Nick Boles, the Conservative MP who drafted the proposal to stay in the single market and customs union, quit the party dramatically last night after the results came out. He blamed the intransigence on his own side. “I accept I have failed. I have failed chiefly because my party refuses to compromise.” Then he left, to protests from colleagues. Investment Slump | Investment plans by U.K. firms slumped to the lowest in eight years, according to the British Chambers of Commerce, as a report showed a slump in confidence amid the Brexit turmoil. No Wiggle Room | If the U.K. hasn’t left the EU by April 12 and there’s another extension of the deadline, the country has to take part in the European elections, European Commission President Jean-Claude Juncker said on Monday. On the Markets | The pound had ticked higher on Monday as expectations grew that Parliament might find a way forward for a soft Brexit, but slipped early on Tuesday as the deadlock deepened, trading at $1.307 as of 7 a.m. in London. Goldman Sachs Group Inc., meanwhile, sees a big opportunity in the pound as the Brexit “big finish” approaches.